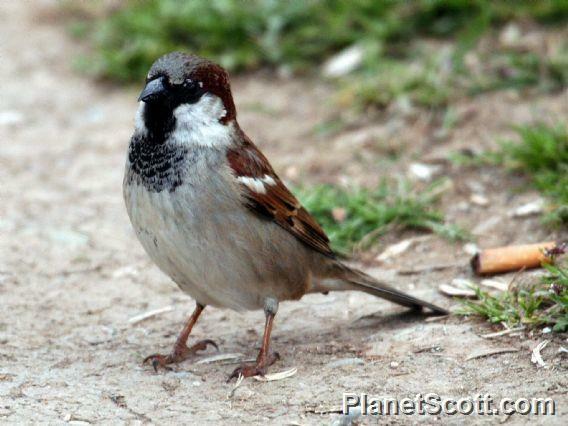 House sparrows feed mainly on seeds, but in the breeding season the adults will take some animal matter (mainly insects), and feed their young on insects for the first part of the nestling period (9). It is a regular visitor to garden bird tables and feeders (5). This sociable species nests in colonies, the untidy feather-lined nests are built in crevices and holes in buildings, tree holes and nest boxes (4). House sparrows are also known to occasionally evict other species of birds from their nests, subsequently occupying them (6). During the breeding season, house sparrows mate very frequently, so much so that their eggs were once highly prized as aphrodisiacs (6). After May, 3-5 whitish, blotched eggs are laid (4). The female incubates the eggs for up to 14 days, after which time both parents share the task of feeding the young for around 15 days (4). Three or more broods may be produced every breeding season (4). The gregarious nature of this sparrow is often most obvious during winter, when most activities including feeding, roosting and bathing, are carried out in groups or large flocks (5). Notes say not common in Veracruz. Not exactly sure where this sparrow was, but it was somewhere not too far from Cu Chi.